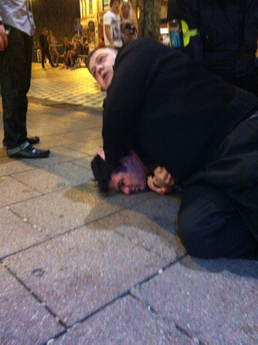 PICTURE: Welsh scrum half and former Mr Duffy, Mike Phillips, being 'restrained' by bouncers outside McDonalds in Cardiff city centre in the early hours of Tuesday morning. (1) Once again the off-field behaviour of international rugby players is called into question, particularly Welsh ones. (2) For once the WRU and the Welsh management have taken a hardline (if not consistent) approach. (3) Perhaps Warren Gatland should think about calling the bouncer into the Welsh squad? (4) I may have missed something, but since when did McDonalds employ bouncers? I certainly think the bouncers could be working with Shaun Edwards on Wales defensive coaching. If I was running any late night business in Cardiff I'd employ bouncers too. Tacklers not releasing, he should be pinged!